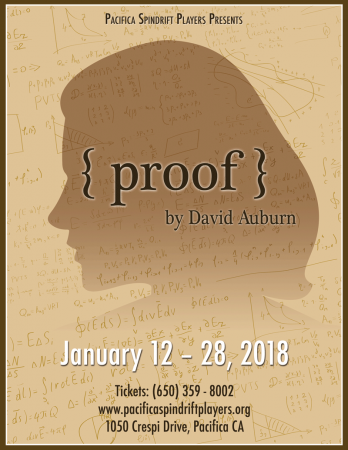 On the eve of her twenty-fifth birthday, Catherine, a troubled young woman, has spent years caring for her brilliant but unstable father, a famous mathematician. Now, following his death, she must deal with her own volatile emotions; the arrival of her estranged sister, Claire; and the attentions of Hal, a former student of her father’s who hopes to find valuable work in the 103 notebooks that her father left behind. Over the long weekend that follows, a burgeoning romance and the discovery of a mysterious notebook draw Catherine into the most difficult problem of all: How much of her father’s madness—or genius—will she inherit? This play is being presented at Pacifica Spindrift Players in our Muriel Watkin Performance Space.